The Volvo V90 is a beautifully designed vehicle with impeccable attention to detail. The popular luxury wagon is available at Mitchell Auto Group with a couple of different steering wheel designs. These style elements complement the rest of the cabin while giving you a ride that stands out amongst the crowd. With more than 100 standard and available features for safety and security, you can worry less about possible dangers while driving around Simsbury, CT.
Navigate crowded streets with the ProMaster's Best-in-Class 36-foot turning diameter, designed specifically to give you nuance in situations that don't give much leeway. One thing we like to do here at Mitchell Auto Group is inform our customers as to all the advantages to buying certain vehicles. The new Ford Taurus is a full-size sedan that comes with several technology features drivers appreciate. Who says that hybrid cars aren't stylish? The Ford Fusion Hybrid is a popular hybrid sedan that's dripping in style. The exterior is beautifully designed to have a modern and sophisticated look. The front end features dramatic accents that will turn heads wherever you go. When you're driving through town at night, you can rest assured that you're being seen. The sedan has standard LED lighting throughout. The headlights feature an angular look that makes the car look like it's always in motion. No ride is complete without some pumping music. The 2018 Golf Alltrack from Volkswagen is a touchscreen compact car that's equipped with high-quality audio equipment and high-tech features that let you enjoy a wide range of media options. The infotainment center utilizes a large 8-inch touchscreen display. You can upgrade your equipment to receive satellite radio with an appropriate subscription. Hitting the road in a performance driven vehicle adds a bit of excitement to the usual driving routine. Feeling at ease behind the wheel of a vehicle that conquers the road at every turn is something to look forward to. The 2018 Dodge Charger seeks to stake its position with the competition by giving drivers such an experience. How comfortable is it to ride in the Ford Flex? One of the principal objections to people mover vehicles is the lack of comfort. Ford designers sought to eliminate this objection in the Flex by adding comfort factors well beyond the norm. 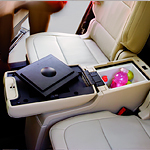 The mid-sized SUV is built to provide maximum room for the occupants.